Among whitewater rafting rivers, the Middle Fork of the Salmon in Idaho is a legend. The pure, clear, free-flowing river drops 3000 feet during its 105 mile Idaho rafting journey through Idaho's remote and spectacular River of No Return Wilderness, the largest wilderness area in the lower 48 states. Natural and untamed, Idaho's Middle Fork is protected by Congress as one of America’s first Wild and Scenic Rivers. It has shaped its course through a rugged and diverse landscape. There are no roads leading to its banks and little remains of man’s brief presence other than prehistoric pictographs and dilapidated log cabins. The whitewater rapids are fun for all ages and provide a certain excitement only Idaho's famous Middle Fork of the Salmon can! Idaho's legendary Middle Fork of the Salmon River is an iconic whitewater rafting trip. Bounce along through more than 100 rapids over the 105-mile stretch of the Salmon River. The free-flowing Middle Fork Salmon rafting trip drops 3,000 feet through central Idaho's remote and spectacular "River of No Return" wilderness. Natural and untamed, scenic and diverse, the Middle Fork of the Salmon River is one of America's first "Wild and Scenic Rivers" protected by Congress. We launch our boats into the Salmon River nearly 6,000 feet above sea level and immediately enter an enchanted forest of fir and spruce. The river is steep, shallow and narrow and we careen through boulder-choked rapids. With each passing mile, side creeks tumble into the Middle Fork's clear sparkling water and deepen the flow around our boats. The whitewater rapids are frequent and challenging on the Middle Fork. Guides speak their names with reverence - Velvet Falls, Ram's Horn, the Chutes, Pistol Creek, Devil's Tooth and House Rock to name a few on this Idaho rafting trip. Dropping in elevation, the Middle Fork Salmon River widens and the spruce forest opens up to vistas of pine-studded mountains. Rafts drift quietly over deep pools of transparent water—home to native cutthroat and rainbow trout. Guides stop the group often to visit nearby Native American pictographs and pioneer homesteads. ROW guides are intimately familiar with this majestic canyon and use their interpretive knowledge to help draw the silent stories from these historic places. Further downstream, the trip enters Impassable Canyon. Granite mountains of staggering dimensions slice out of the clear Middle Fork water and into the cobalt blue Idaho sky. We'll stop for hikes underneath Waterfall Creek and up to Veil Falls. Soaking in the many natural hot springs along the Middle Fork are highlights for many of our guests. As we near the end of our Idaho rafting journey, having dropped 3,000 feet in elevation and gained a lifetime of memories, it's hard not to envy the Native Americans and pioneers who spent their whole lives in the vast wilderness along the Middle Fork of the Salmon River. ROW also offers raft-supported hiking tours of this magnificent country. Load up a day pack with supplies to get you through the day, then hike to camp where you're gear will be waiting, tent will be set up and food will be cooking. 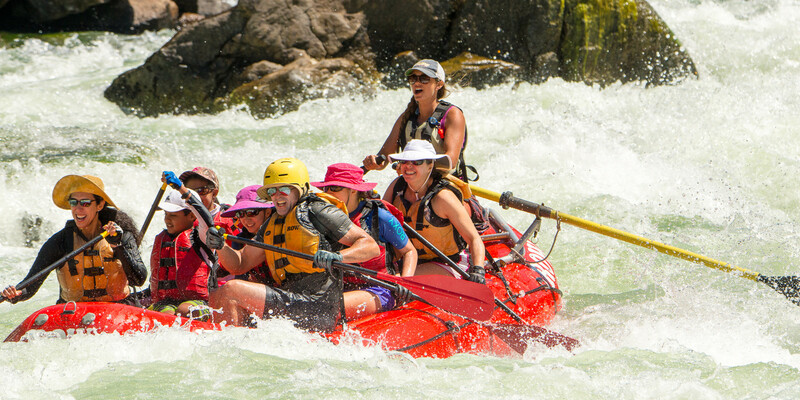 Extend your Middle Fork rafting trip! You may consider visiting our own River Dance Lodge, a beautiful log cabin adventure resort just a few hours drive away. Horseback riding, hiking, fishing and biking are a few of the available activities. If you're on your way to Glacier National Park this is a great stopping point for a day. Maybe you have experienced the Middle Fork of the Salmon and are looking for the next rafting bucket-list adventure? If so, we suggest heading down to Chile on a Futaleufu River rafting trip-of-a-lifetime! "The selection process was competitive and our editorial team worked long and hard to find...most authentic, most innovative, most immersive, best-guided, and most sustainable tours. Our theme this year was transformation. The outfitters we selected are experts at creating trips that have the power to change lives—the lives of the traveler as well as the residents of the destinations,” notes executive editor Norie Quintos. “The trip is usually just the beginning." Since 2006 this is the fifth time that one of ROW Adventures' tours has been named to this exclusive list. Arrive in Stanley by 7:00 pm MST to meet ROW’s team leader at the Mountain Village Inn for a one-hour orientation meeting. We'll answer any last-minute questions and provide waterproof bags for your gear. Dinner on your own. You could schedule some time at the hotel’s private hot spring (reserve when checking in). Meet your group at 7:30am. We'll take a two-hour bus ride to Boundary Creek and start our trip. At 6,000 feet elevation, the air is crisp and the forest thick with fir and spruce. At the river we'll go through a safety orientation while your personal gear is loaded onto our rafts. After orientation everyone chooses a raft (paddle or oar-powered) and climbs aboard. The first 15 miles of the Middle Fork are fast and rapids are steep, narrow and come in quick succession. During lunch we'll explain how we minimize our impact on the river with Leave No Trace camping ethics. After lunch the river continues to be lively and challenging. Every few hundred yards a creek tumbles into the river increasing the flow. We travel between 10 and 15 miles the first day and arrive at camp around 4:00pm. Enjoy the free time for hiking, fishing, reading or just relaxing. Hors d’oeuvres are served around 6:00 and dinner around 7:30. After dinner a campfire is lit and the warmth invites all to share stories of the day, and life. We awake around 7:00am and enjoy fresh-brewed coffee. Breakfast is served and you pack up your personal gear. The rafts are loaded and we depart from camp around 9:30 for an adventure-packed day of rapids, magnificent scenery and fun. We make it a point to visit one or two pioneer homesteads on these first few days. We'll likely stop to explore the old miner’s camp at Powerhouse Rapids. Today’s a good day to keep your eyes open for the nest of the American Dipper, a small gray bird that swims underwater and builds its nest above fast-flowing water. We'll have plenty of fun rapids as the river continues its quick descent. We’ll stop for a soak in Sunflower Flat Hot Springs where several pools above the river cascade over a rocky cliff to create nature’s perfect shower. We make camp around 4:00pm and enjoy hiking, fishing and relaxing. After dinner the night sky welcomes stargazers and, later on, the river lulls you to sleep. The river canyon opens now and we’ve dropped over 1,500 feet in elevation. Days and nights are warmer. The fir and spruce give way to ponderosa pines, sagebrush and riparian hardwoods. The sparkling-clear water carries us swiftly along as the river channel widens and narrows with the underlying geology. One of today's highlights is stopping to view pictographs of the Native American Tukudeka, or Sheepeaters, who lived in this canyon until the 1870’s. The afternoon is casual as the current slows a bit. We'll learn about early pioneers like Charlie Norton, who had a run in with a bear as amazing as the saga of Jedediah Smith. By mid-afternoon we arrive at camp near Loon Creek, around 50 miles from our starting point. Tonight’s highlight is a hike to the Loon Creek hot springs and anglers may enjoy casting a line into Loon Creek. Summer evenings are long, with darkness arriving around 9:30pm in June and July. The night sky, crackling campfire and fresh mountain air will help you sleep like a baby. Another day of fun rapids and incredible Rocky Mountain scenery. We’ll likely see big horn sheep as we pass several mineral licks. Those fishing will continue to find bountiful trout and birdwatchers are likely to spot golden eagles and falcons. We pass our last hot spring at Hospital Bar, so named because early cattlemen let their stock rest and feed at this large flat and easy ford across the river. We'll also see Tappan Ranch, where Red and Daisey Paulsen-Tappen grew a bountiful garden and raised a family with self-sufficiency and $300 a year in the 1920’s and 30’s. Continuing on we run the Tappan rapids. This is a great photo opportunity with plenty of splashes and thrills. The final miles to camp offer a chance to lean back and take in the monumental scenery of the River of No Return Wilderness. Today we run Haystack Rapid, the most dynamic rapid on the river. Side canyon “blow outs” have changed its course twice in the last few years. This is the official start of Impassable Canyon. Below Haystack rapids, the canyon narrows and deepens creating a series of action-packed rapids. A favorite stop is at Waterfall Creek, where a steep trail leads up to the Bighorn Crags. We walk beneath the falls and on hot days finish with a jump into the river. Shortly downstream the river cuts into the Idaho batholith – the largest monolithic chunk of granite in North America. The river has carved into the granite and created towering walls for neck-bending panoramas. Further downstream we stop to hike to the base of Veil Falls, a soul-stirring cavern replete with pictographs and magic. Today’s scenery is truly among the most astounding on earth. From camp the silhouette of canyon walls against the wine-dark sky will captivate you as you reflect, celebrate and further connect with newfound friends on your last night on the Middle Fork. As we push off from shore the river takes us past the former hideout of Earl Parrot, Hermit of Impassable Canyon. His story is as big as the canyon and adds just one more thread of wonder to your Middle Fork experience. As the sun breaks over the canyon rim, more big rapids greet us as we pass beneath vistas of staggering dimensions. We stop to enjoy lunch on a glistening sand beach just a few miles above the Middle Fork's confluence with the Main Salmon. We proceed onto our takeout, carry personal gear to the waiting bus and settle back for a two-hour ride to the town of Salmon. Enjoy a hot shower and change of clothes then meet your guides for ROW’s hosted farewell dinner. If you drove to Stanley and had your car shuttled, it is waiting for you at the hotel. If you are flying home, you'll board an air taxi for the one-hour flight back to Boise to connect home. You may consider visiting our own River Dance Lodge, a beautiful log cabin adventure resort just a few hours drive away. Horseback riding, hiking, fishing and biking are a few of the available activities. If you're on your way to Glacier National Park this is a great stopping point for a day. ROW is proud to be an Equal Opportunity recreation service provider and employer under permit from Salmon, Payette, Boise and Challis National Forests. All our operations and facilities are operated on a non-disciminatory basis. ROW Inc. is bonded and licensed by the State of Idaho Outfitters & Guides Licensing Board. Why go with ROW on the Middle Fork of the Salmon River? ROW Adventures is a seven-time National Geographic award-winning company. We haven't only been "operating" since 1979, we've never changed ownership! And for over two decades we've been providing amazing adventures on the Middle Fork of the Salmon River. One of the reasons that our Middle Fork trip is such a fabulous adventure is the incredible variety of things we do and see along the way. We don't have blinders on and simply chug guests down the river. Rather, we make sure to visit these incredible sites such as old pioneer homestead cabins, Indian rock art sites, hot springs, waterfalls and we also have a few other 'secret' surprises in store for you. The quality of our food reflects the quality of the wilderness environment of the river canyons. Sustainably harvested wild Alaskan Salmon served with a fresh garden salad; Prime Rib combined with a Chilean salad and Idaho mashed potatoes or made-on-the-river Lasagna are a few possible entrees. Desserts are made each evening in our Dutch ovens and range from authentic cobbler and pineapple upside-down cake. We serve juice each morning and moderate amounts of wine with dinner. Your trip is enriched by knowledgeable guides who share the canyon's cultural and natural history. No other company on the Middle Fork of the Salmon River trains guides like we do and most of our guides are also Certified Interpretive Guides through the National Association for Interpretation. Beyond the critical skills each of our guides are exceptional people willing to share, teach, listen, learn, laugh, play, discuss and above all work hard to provide you with an informative, relaxed spontaneous adventure. We staff our trips with one guide for every 3-4 guests providing you the ultimate in personal attention. ROW Adventures will happily accommodate food allergies or dietary needs with advance notice by completing the trip application. . Our trip application allows you to personalize your river experience including which type of craft you would like ride in. Complimentary beer, wine, juice and soda, all in moderate quantities, is provided. We are proud to serve fine local Northwest wines. We always have plenty of ice! All rafting gear is also included to make things easy for you. We provide complimentary wetsuits & wetsuit booties early and late season to make sure you stay warm and comfortable on the river. We offer you a choice of river craft including oar rafts or paddle rafts. We understand that it is important to be as active as you like or enjoy the scenery this is why we offer the two different types of crafts. Our trips are designed to begin in Stanley and end in Salmon. While this may seem a little inconvenient, we do it for a reason. If a trip includes transportation back to Stanley at the end of the trip, you must be off the river no later than noon (and many companies are off by 10am!) as it is a two-hour drive to Salmon, plus another three hours to Stanley. ROW doesn't believe that you should pay for a day on the river, but end up on a bus for most of it. Thus, we enjoy lunch on the river our last day, arriving at the take-out about 2-3pm and to the town of Salmon by around 5pm. Permits and Licenses - ROW Inc., doing business as ROW Adventures, is proud to be an Equal Opportunity recreation service provider and employer under permit from Salmon, Payette, Boise and Challis National Forests. All our operation and facilities are operated on a non-discriminatory basis. ROW Inc. is bonded and licensed by the State of Idaho Outfitters & Guides Licensing Board. The quality of our food reflects the quality of the wilderness environment in the Middle Fork canyon. We hand-select the freshest fruits and vegetables we can find and pack them carefully in huge ice-coolers. Likewise, these coolers carry fresh dairy products and meats. From these ingredients, we prepare bountiful, healthy meals. Because the Middle Fork has no dams, the water is highest when early-summer warmth melts the snow from the high mountain peaks. Winter snowpacks affect each season’s water levels. In general, the river peaks in mid-to-late June. Early June to early July is the time to come if you want high water thrills. Mid-July brings somewhat lower flows as the bulk of the snowmelt has already runoff and novice rafters may be more comfortable joining us at this time. The river gradually lowers as the summer passes, bringing incredible clarity to the crystal waters. Late August and September are wonderful times to be on the river because few people are around and the colors of the hills become more radiant. This is also the best time to fish the Middle Fork. Air taxi transport to/from Boise is available. Or, drive to Stanley and shuttle your car to the takeout point in Salmon. If low or high water requires a flight into Indian Creek, there is an extra charge. Call 1-800-451-0841 for pricing. In addition to the sweep boat that carries all the camping gear, we use two other kinds of river craft. Many people enjoy rotating between both crafts during a trip. On the few trips we operate with less than 13 guests, we may not have enough people to support a paddle raft. What do you do when not on the river? One of the reasons the Middle Fork is such a fabulous trip is due to the incredible variety of sites and activities along the way. ROW takes pride in historical interpretation and takes advantage of as many side excursions as possible. We explore at least three different Native American pictograph sites. We stop to soak in hot springs and always try to camp at one of them. Our trip is planned so the fifth day doesn't have many river miles. We stop and explore Waterfall Creek and maybe lead a hike under the falls. After lunch, we hike to see Veil Falls and we have a few other 'secret' surprises. We strongly believe that understanding builds greater appreciation and we hope our love of this majestic canyon is contagious. ROW makes this easy... You bring the clothes you want to wear at camp and on the river. Then, once you make a reservation ROW will send you a complete packing list. ROW provides the camping equipment, food, and beverages.